Looking for the perfect way to get a large group of friends, family, students, coworkers, or your entire social group safely to Manhattan Beach without hassling with traffic, parking, and complicated seating arrangements? Renting a party bus in Manhattan Beach allows you to take full advantage of this wonderful seaside village and all the great attractions it houses without any of the headaches. Whether you’re travelling with ten people or forty-four, White Rose Limo has the perfect party bus for your Manhattan Beach daytrip. We operate throughout South Bay, Orange County, and Los Angeles—pretty much anywhere in Southern California—so get in touch and start planning your Manhattan Beach getaway today. But you also get more room for more friends, more family, and more fun. 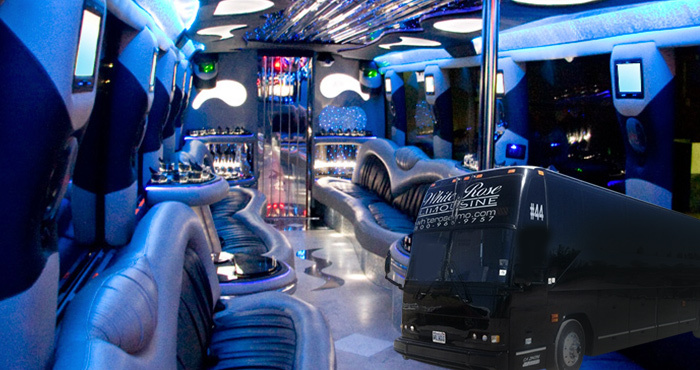 In fact, our party buses are spacious enough that you can even dance while the party is rolling down the road! Probably the biggest benefit of renting a smaller party bus in Manhattan Beach is the smaller price tag—which can easily be split between all or even some of your guests. 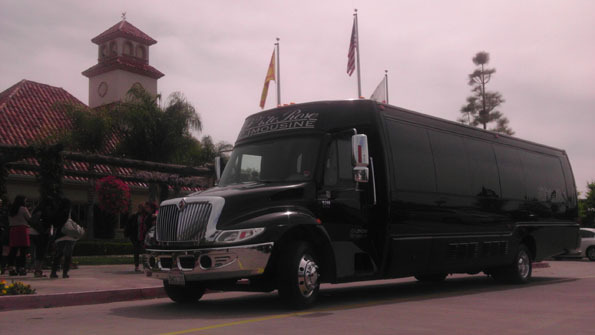 This is our smallest party bus rental in Manhattan Beach—but don’t let that fool you. This luxury bus has been completely retrofitted with custom-built comfort and many of the same amenities you’d find in one of our biggest buses. 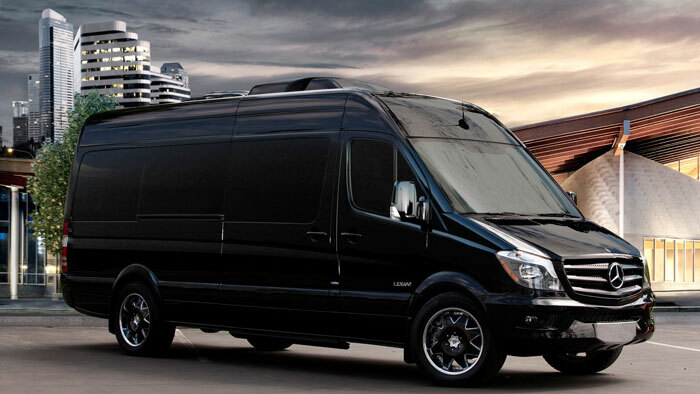 Plus, our Mercedes Sprinter Limo Bus is not only roomier, it’s easier to get in and out of, making it the perfect party bus in Manhattan Beach for guests with mobility issues. 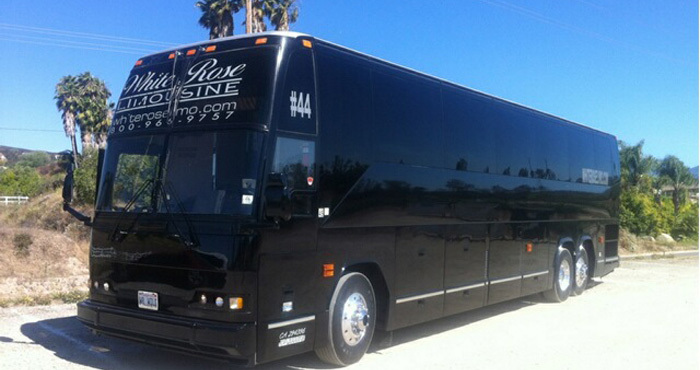 Why Rent a Party Bus in Manhattan Beach? 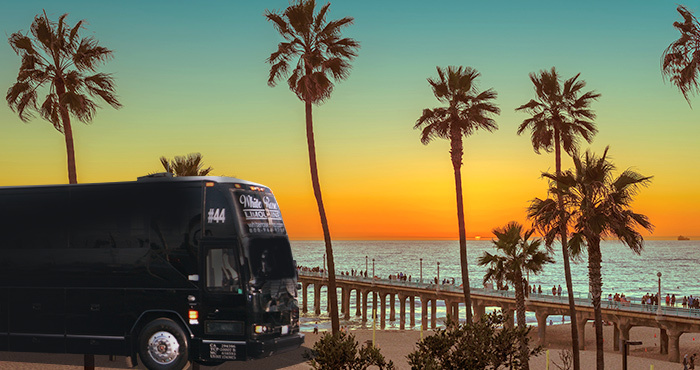 Renting a party bus in Manhattan Beach is simply the best way to get a large group of people to this beach getaway destination from anywhere in South Bay or further away in Southern California. As a historic seaside town, Manhattan Beach is cramped and struggles to cope with its newfound popularity. That means that parking in Manhattan Beach is always a premium. Finding a spot by itself can be a challenge and most spots are two-hour parking only—not nearly enough time to fully explore this quaint and exciting little ocean playground. Your party bus rental will pick you up at your door, deliver you to Manhattan Beach, and hang around for anything you need until it’s time for the ride home. So, if you’ve always wanted to see Manhattan Beach, or if you’re interested in visiting one of the excellent attractions here with a group that’s just too big to fit in one vehicle, consider renting a party bus in Manhattan Beach. Our rides are more affordable than most people imagine. If you’re planning a bachelor or bachelorette party, a night of clubbing, a pub crawl, or just a no-holds-barred escape to the seaside treasure that is Manhattan Beach, a party bus just may be the perfect ride for you. When you rent a party bus in Manhattan Beach, it is fun for everyone. Nobody gets stuck being the DD. None of your guests have to fight with traffic or try desperately to find that one last remaining parking spot. You don’t have to worry about getting parking tickets, falling asleep on the ride home, or arranging carpool transportation for all of your friends. 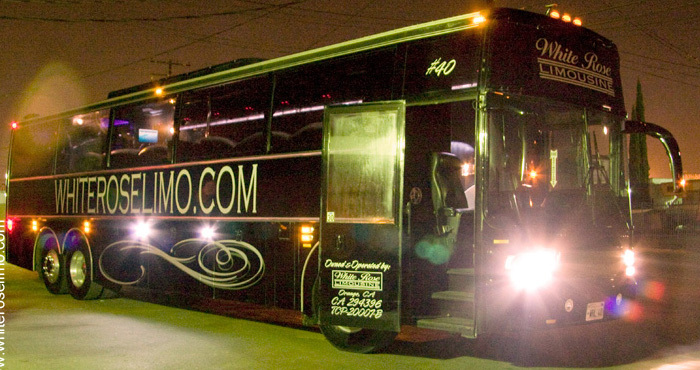 A party bus lets everyone in your group enjoy the day, evening, or nightlife without any hassle to dampen the fun. Don’t let the “party” in party bus fool you. While our rides were originally intended to give groups of partiers an easy way to hit the town and take the party to the next level, White Rose has been renting party buses in Manhattan Beach to groups of all sorts. From school groups and church groups, to students headed to prom, to senior groups, to corporate team building excursions—our party buses can be as wild or as mild as you make them. Not quite sure what Manhattan Beach has to offer a large party of friends, family, and coworkers? There’s more to this California beach town than you might first suspect. Luxurious little boutique shops await around every corner. From art, to fashion, to collectibles—you’ll find whatever your heart desires here. Spend a day strolling The Strand, have breakfast, brunch, lunch, or dinner, and hit a hotspot for a cocktail or two all while shopping until your heart is content. From traditional seaside fair (seafood and the old surf and turf) to adventurous offerings like Pan Asian Cuisine, Manhattan Beach is a foodie’s paradise. Take out joints, sit down restaurants, bistros, and pubs—you’ll find them all. Make a day of it and eat exceptionally from breakfast through dinner! From family friendly restaurants and pubs like Mr. Pockets Sports Grill and Billiards to Adults-Only “dive bars” like Ercoles 1101, Manhattan Beach has something for everyone. Plan a chill night on the town or really live it up—the choice is yours. Student groups love the educational attractions in Manhattan Beach. Two of the most popular include the Roundhouse Marine Studies Lab and Aquarium and the Manhattan Beach Botanical Garden. The first is an exhibit-packed aquarium located inside the two-story “shack” on the end of Manhattan Beach Pier. The second is a lovingly created monument to California’s native coastal flora and fauna. Both are open to the public. Both offer guided tours. Both offer special educational classes/seminars. And both can be “rented” for an hour or the whole day. Maybe some of your group wants to hit the beach while others want to relax. There are a ton of great little day spas right in Manhattan Beach but the most popular is Trilogy Spa. Here you can get massages, facials, and more (including a romantic couples massage). So don’t think a day at the beach means getting hot and sweaty in the sun. Don’t know which party bus best suits your needs? Give our helpful staff a call and arrange a time to see any of our buses in person. We can help you with itineraries, travel planning, custom decorations, and more to make your Manhattan Beach getaway nothing short of amazing. Get a free quote online or call 714-288-0066 today. *Guests can customize any party bus experience with decorations of their choice. Flowers, balloons, banners, and more can all be added—with advanced notice. Contact our helpful party bus planners to reserve a time to decorate the bus yourself, have the vendor of your choice do the work for you, or—if you purchase the decorations yourself—we can decorate at no extra charge. Want to make a splash when you arrive? Rent our special Red Carpet (usually reserved for wedding parties only) and look like Hollywood Royalty.